Yup, I've jumped the shark. First it was the Google Ads. But I took it out also because, first I have no idea where to put them to generate enough money, and second, well, my blog's not that popular either so who the hell will click on those ads right? So I took them out Google Ads. Learn more about this in their FAQ. I just got approved and I don't have blogging tasks yet. I guess the cool thing about this is you can write about the product in ANY way you want -- you don't have to necessarily compliment the product. Oh, and better get a PayPal account first, because that's how they do pay-outs. 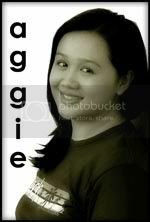 Please update your link din for me to this http://www.mbaviso.com/aggie.